Baleen is a strong, yet flexible material made out of keratin, a protein that is the same material that makes up our hair and fingernails. It is used by whales to filter their prey from the sea water. Whales in the Suborder Mysticeti have several hundred plates of baleen hanging from their upper jaw. Like our fingernails, the baleen grows continuously. The baleen plates are about a quarter-inch apart and are smooth on the outer edge but have a hairy fringe on the inner edge. The fringe on the plates overlaps and creates a mesh-like strainer inside the whale's mouth. The whale uses this strainer to trap its prey (usually small schooling fish, crustaceans or plankton) while it filters out the sea water, which it cannot drink in large quantities. Some baleen whales, like the humpback whale, feed by gulping large amounts of prey and water and then using their tongue to force the water out in between the baleen plates. Other whales, like right whales, are skim feeders and move slowly through the water with their mouths open as the water flows in the front of the mouth and out in between the baleen. Along the way, tiny plankton is trapped by the right whale's fine baleen hairs. Baleen is historically important as it was sought by whalers, who called it whalebone, even though it is not made of bone at all. The baleen was used in many things such as in corsets, buggy whips, and umbrella ribs. 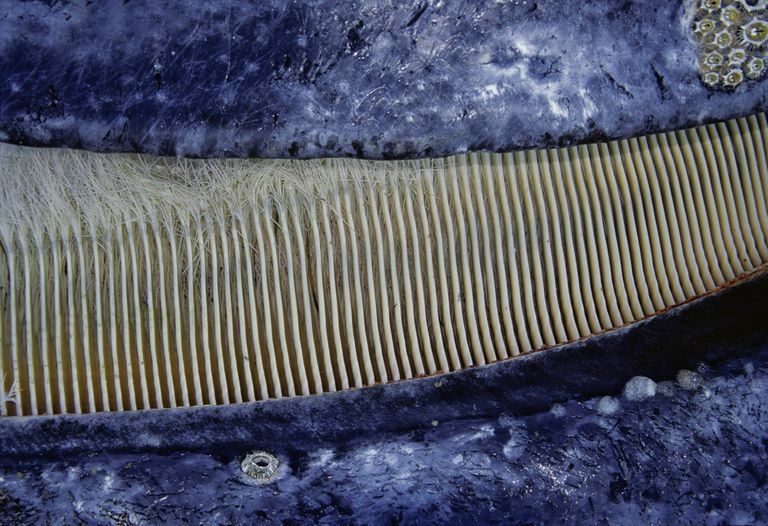 Examples: The fin whale has between 800-900 baleen plates hanging from its upper jaw.